I didn't draw a webcomic since last year so is natural to come in full force with a subject anchored in actuality and this obviously is the vote for the Fedora 11 release name. And do not take the webcomic as a recommendation on what to vote, the "sausage" was not my first vote (also not the last), it is for me the perfect opportunity for [bad] jokes. So don't look at me, go and vote, you surely don't want to be responsible if a bad name wins. Unfortunately, there is another event this week, the Boston FUDCon, and I can't cover both: one issue each week, one topic covered. But I got an idea about a guy digging a whole in the ground with the intention to reach the other side Earth in the hope to find a FUDCon related joke subject. PS: Today I am pimping one more vote, go and help our friend to shape the revival of the K3RNEL webcomic. PPS: for anyone speaking another language in addition to English, it should be evident how hard I made for myself the job to translate this issue (I maintain a Romanian translation). For those who don't, here is a hint: I translated/adapted "baloney" with something like "cabbage... with sausages". Damn translations! "... maybe an university ..."
"an" is used before words that start with a vowel sound, not words that just start with a vowel. "university" starts with the sound "you", so "a" should be used. thanks Pepsiman, my English grammar is indeed really bad. I don't worry, I only wish we had such a hated debate about the comic (subject or implementation) instead of grammar. But on the bright side, if people bothered to comment anything is something. 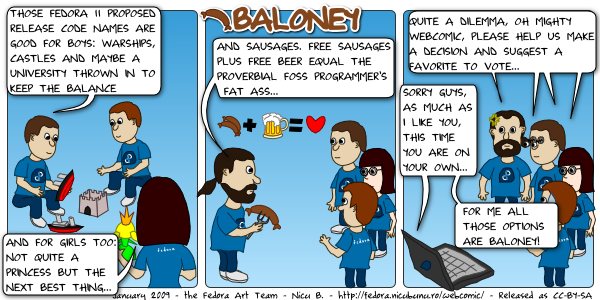 So are you suggesting that "baloney" should be the next Fedora code name? It is better than the Ubuntu ones! Mmmmm.... food! "But I got an idea about a guy digging a whole in the ground "
By "digging a whole" I guess you mean "hole"?